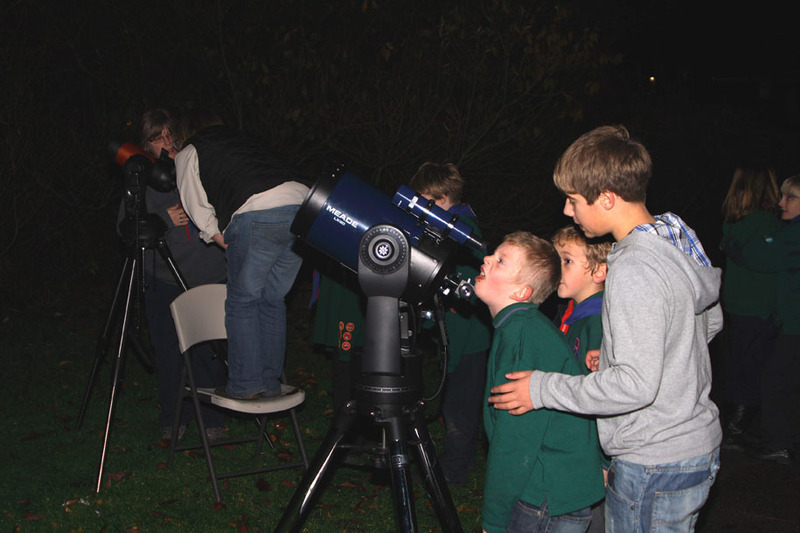 On the evening of the 8th November 2010 I attended a meeting of the 66th Derby Cub Scouts at Spondon, Derby where some of the lads and lasses were starting their Astronomers Badge. I was asked to bring along a telescope by my colleagues wife (Jeanette Phoenix) who is one of the leaders there. She also has a strong interest in astronomy and so she took her Celestron Nexstar along and I took the Society's Meade LX90 along ... and prayed for cler skies. The prayers were sort of answered because in the breaks in the fast moving clouds we were afforded spectacular views of Jupiter. One lad even kept the longest Wwooowwww! going when he looked through the 8” at the massive planet. All four moons were on show and the Great Red Spot was just starting to peer round the edge of the planet, although due to wind and turbulence it wasn’t easy to see at all. Then the clouds moved in and we had to retreat inside so that questions could be asked both ways about things in the sky, constellations, the difference between stars and planets, how many planets there were in the solar system (and even at that age, the lads and lasses even came up with the correct answer, depending on viewpoints, of 8 OR 9!!!! (and the reason for there being 8 OR 9!!!!) etc. They even were asking questions about the recently discovered earth like planet!!! Science is getting through to the younger generation!!! Anyway, here is a photo of the assembled pack, peering through the LX90 and also Jeanette’s Celestron... and when I say peering, the finder on the LX90 was put to very good use by them as well as the main scope!!! !